If river rafting brings to mind shooting through whitewater rapids in a canyon with a name like; Devils Elbow, with dry suits and hard paddling just to stay in the boat. Doing this in a Michigan winter might sound cold and miserable. But change images, think floating down a lazy river with time to enjoy the quiet of the woods, the snow and a chance to see wildlife. Now does that sound fun? My husband, John and I thought we would give it a try. 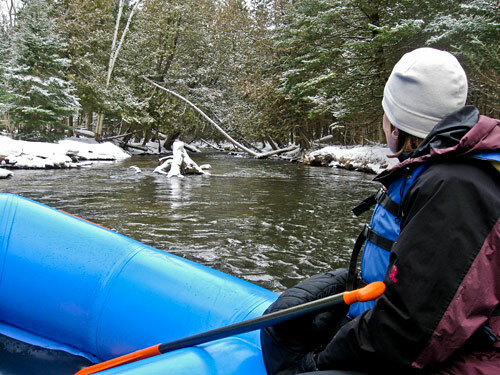 Jordan Valley Outfitters offer a 2-2 1/2 hour paddle down the Jordan River. We met our guide, Scott and his wife Kay at their livery in East Jordan. After paying our fees and signing the waivers (standard on most adventures), our group hopped on the bus with our raft in tow, and headed for the put-in. At the river the eight-person rubber raft was slid into the water, life jackets were passed out and we received some basic instructions like; which is the left side of the boat and when we should paddle. Everyone was carefully settled onto the raft and we were off. 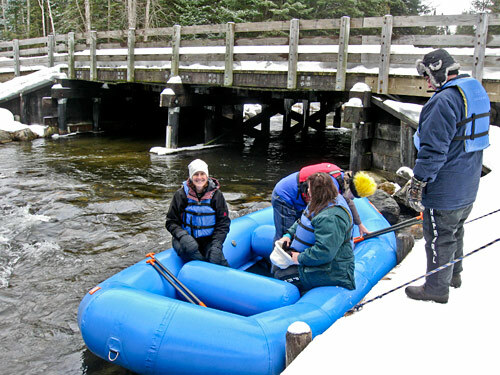 The guide does most of the work keeping you floating down the center of the narrow winding river, with a call now and then to “all paddle forward” or “all reverse”. That gave us a chance to notice recent beaver activity, and where the river otters had been sliding into the water. We even saw a pair of deer on the bank as we quietly floated by. All too soon the bus was there at the take-out for the ride back to our cars. 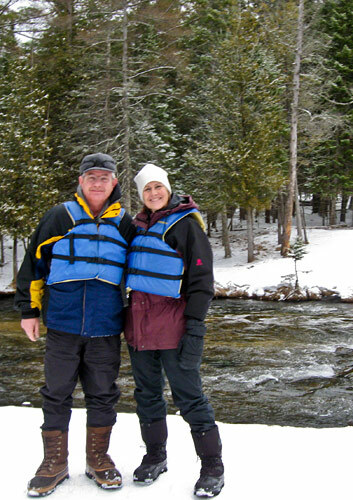 Besides the basic paddle that we did, Jordan Valley Outfitters offer guided snowshoe hikes, where they bring snowshoes for the group and stop part way down the river and lead a hike. Another choice is the dinner paddle; you float to where your meal is cooked on the river bank. But the one that sounds the most interesting to me is the full moon paddle, the second half of the trip is done in the dark and the guide steers by sound and his knowledge of the river. I might have to go back and try that one. 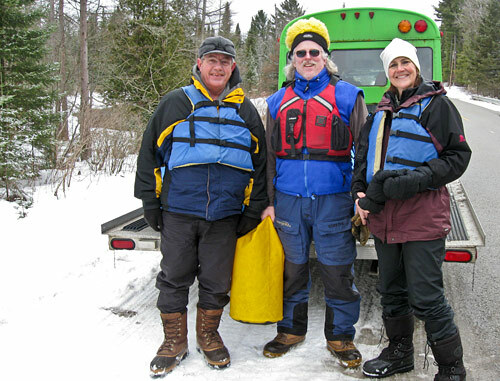 If you decide to try this trip or one like it, remember to dress warm – it is winter, be confident you will stay dry, and the paddling is not very difficult. Oh, and don’t forget to bring your camera.